I have been absent from the blog “scene” for sometime, and I apologize. But I have been busy. 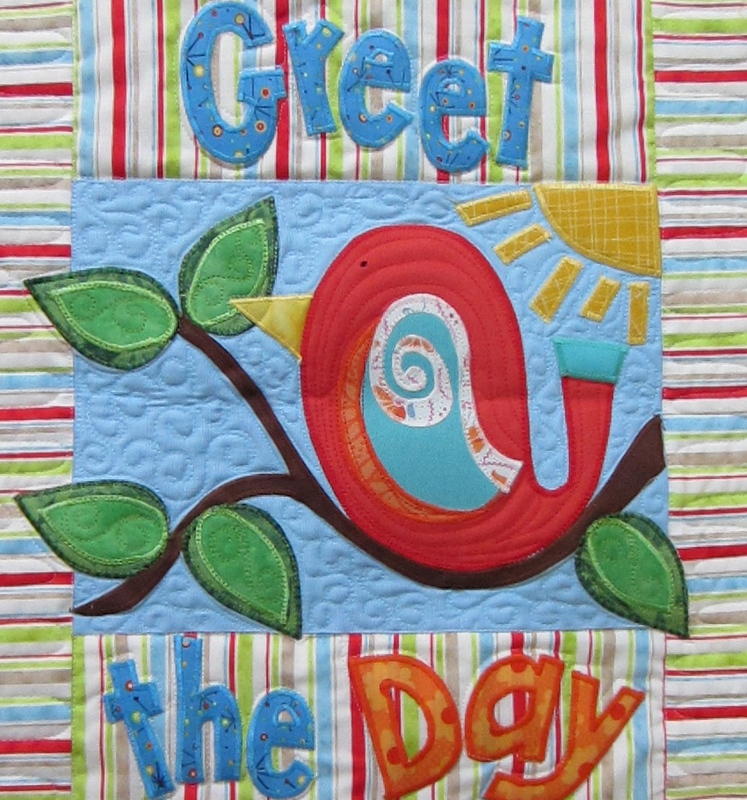 My last post was about my retirement from my long arm quilting business (at least for the immediate future). But now I have a new career. I have been hired by the Clark County School District (Las Vegas, NV) to teach in an elementary school of 900 students. And I teach them all! I am their new music teacher. I am an Orff specialist (you can google that!) 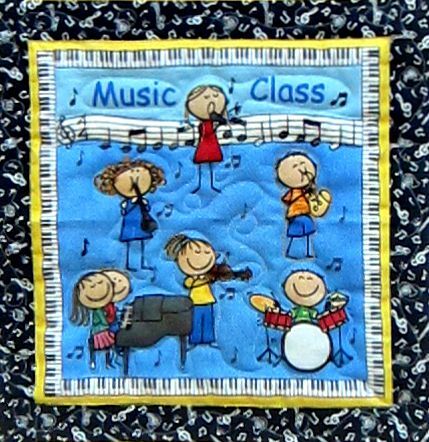 teaching general music to grades Kindergarten to 5th grade. I will also teach choir and a select percussion ensemble. 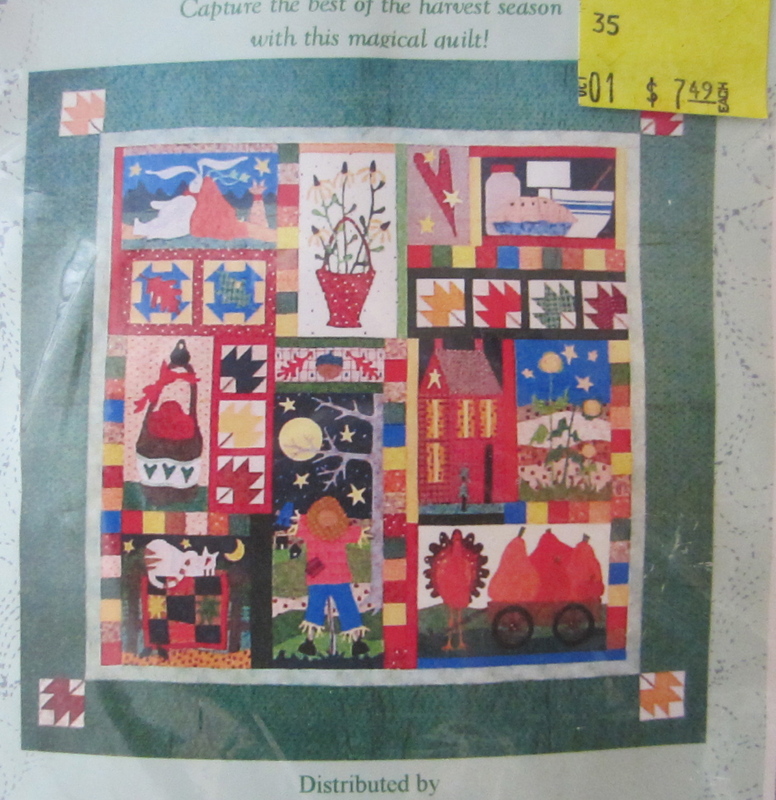 It’s what I did before I became a professional quilter. 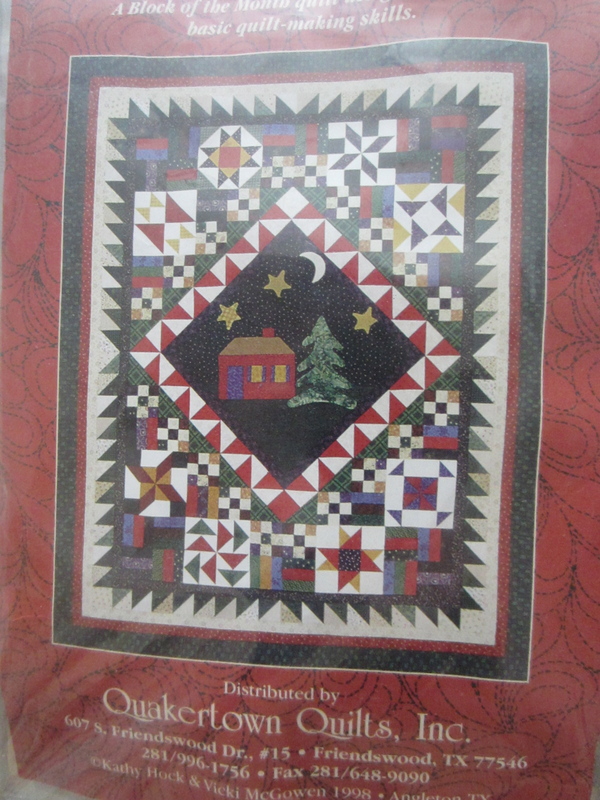 But I am not done with quilting. 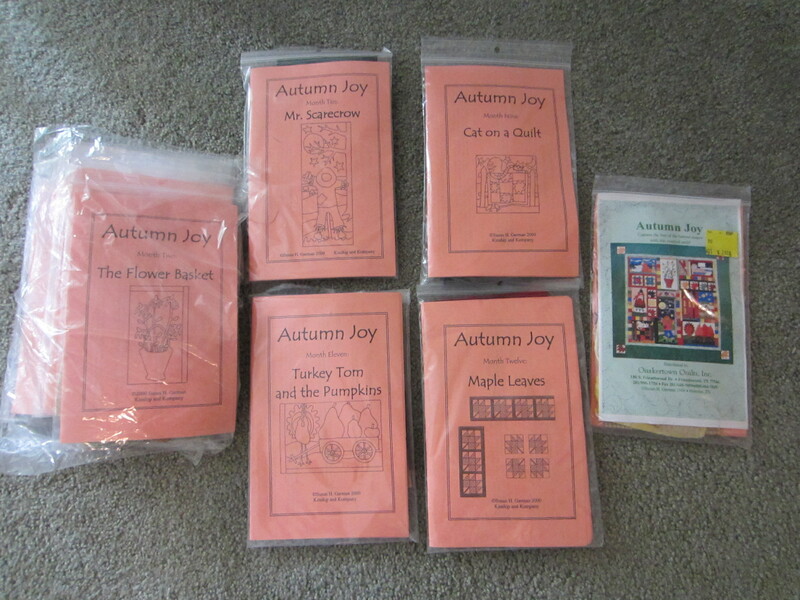 So what would a music teacher/quilter do? 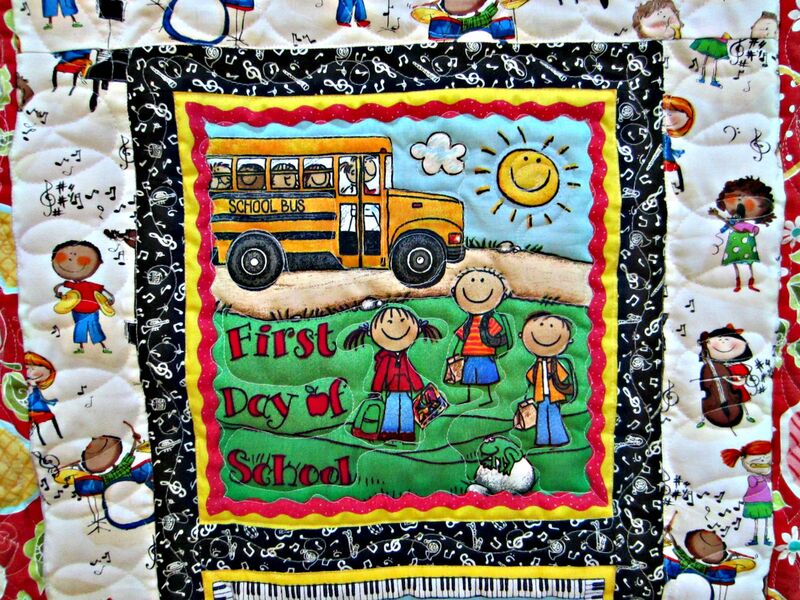 Make quilts to decorate her classroom, of course! Here is the first. It’s going on the wall next to my classroom door. I’ll be showing a few more of my creations in the next few days. 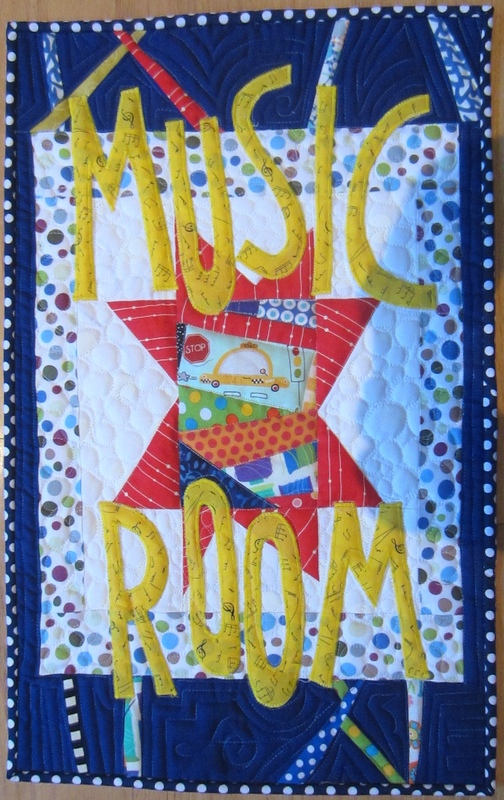 What every music classroom needs! 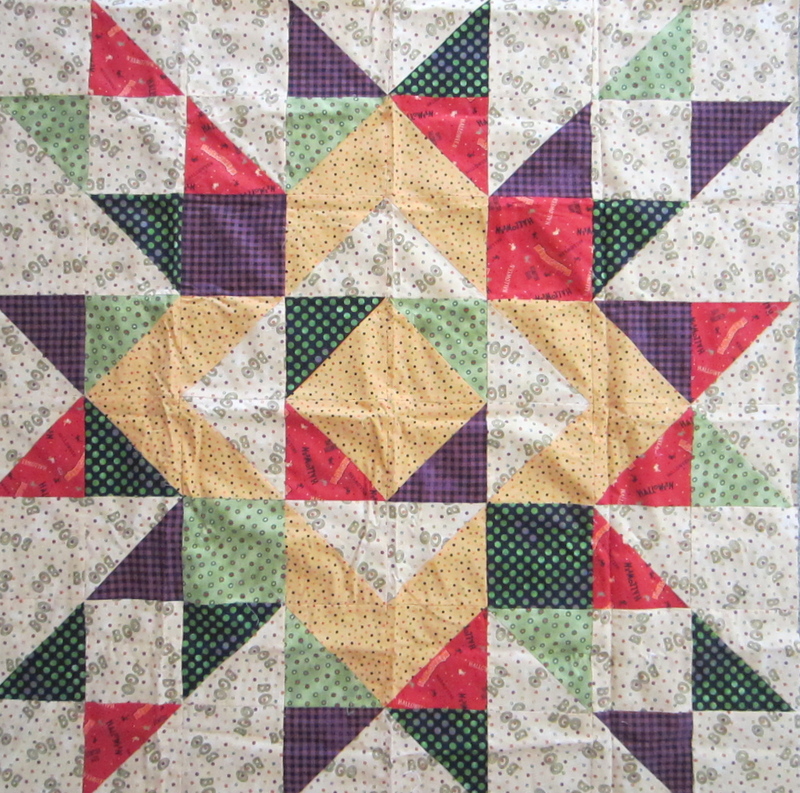 If you are a quilter, you are very familiar with UFO’s (Un-Finished Objects). 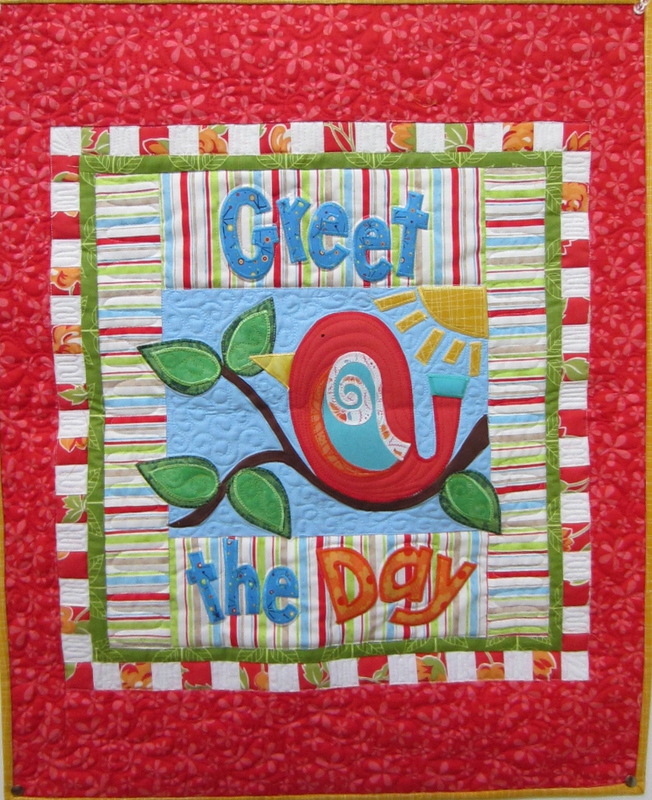 Dedicated quilters (and other crafters) have a LOT of those. I have too many to count. I buy all the materials, start a project, and then move on to something else before I ever finish. Some times I just buy the fabric and never start at all! Well, I’ve dedicated this month to FINISHING! I thought I would share some of these UFO’s and then let you know in the coming days of my progress. Here are a few of the unfinished things I found lying around. I have dozens and dozens, so I will just give you a peek at a few. This little Halloween table topper just needs to be quilted. 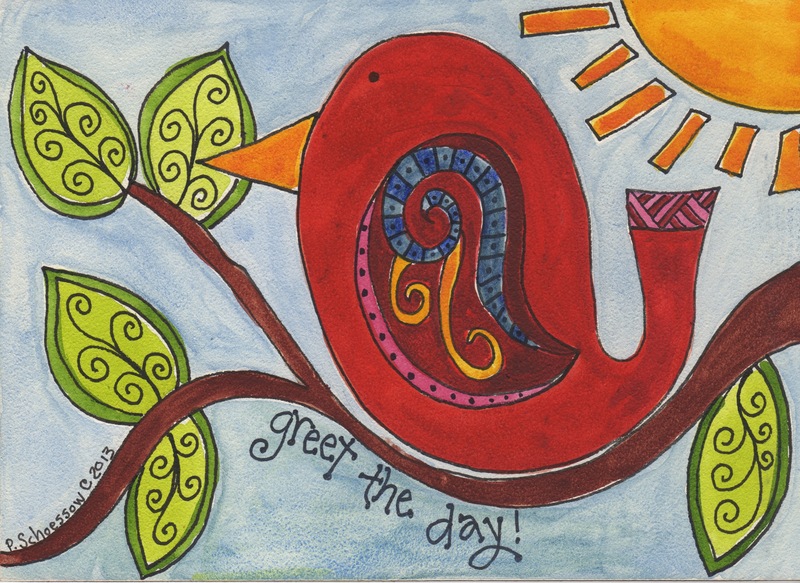 Maybe I will add a border. I found these blocks on Ebay some time ago. I’d guess they are from the 50’s or 60’s. They are handpieced. I added the polka dot and navy fabrics. I have six blocks. 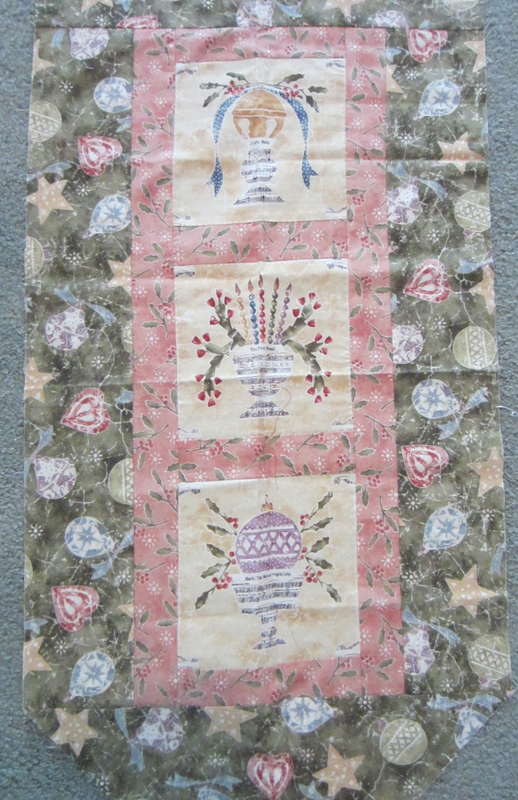 I could probably make a little lap quilt. 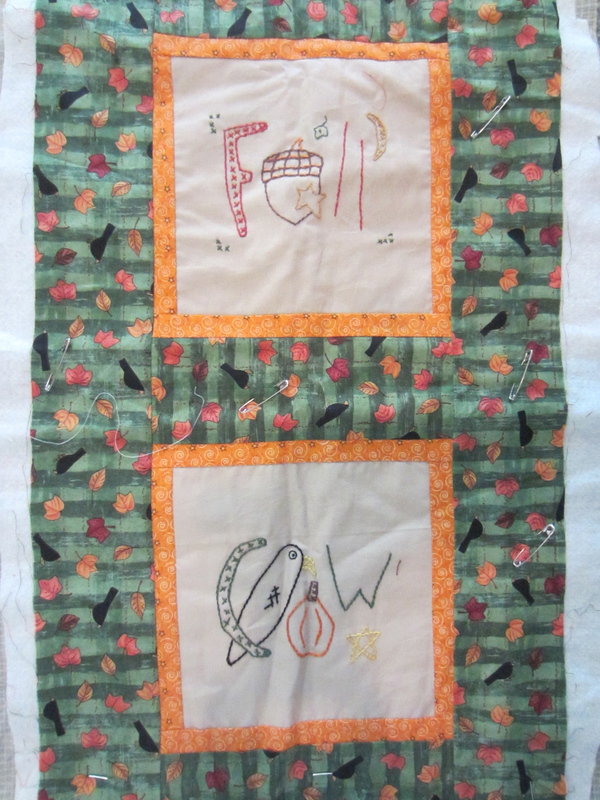 This little Fall stitchery is almost done. 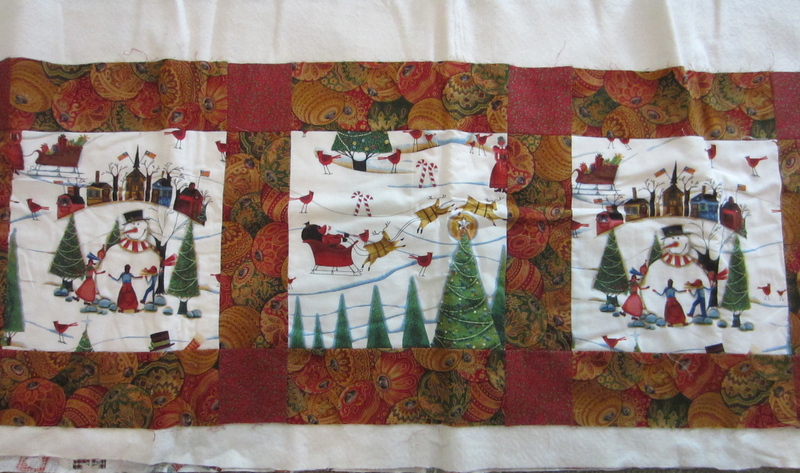 I hope it looks cuter when is is quilted. 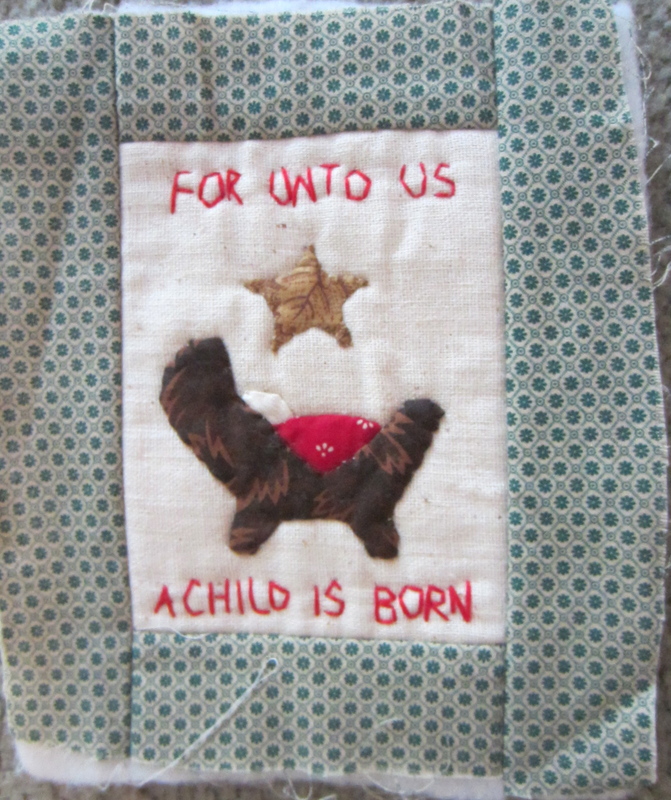 Same with this tiny wallhanging. 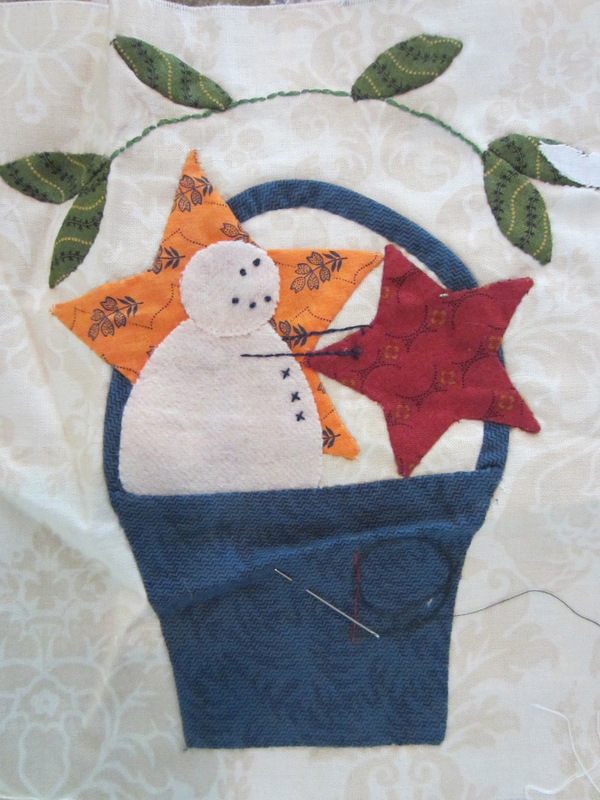 It’s my first attempt at hand applique. 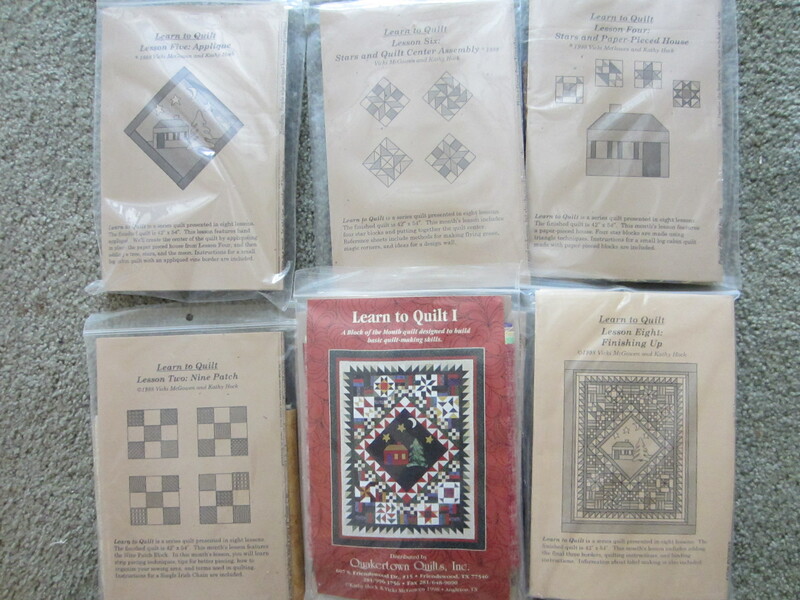 I’m ashamed to say I have purchased whole quilt kits that I never even started. I’m not even sure I like them anymore. If I do tackle them, I will probably update the fabrics. 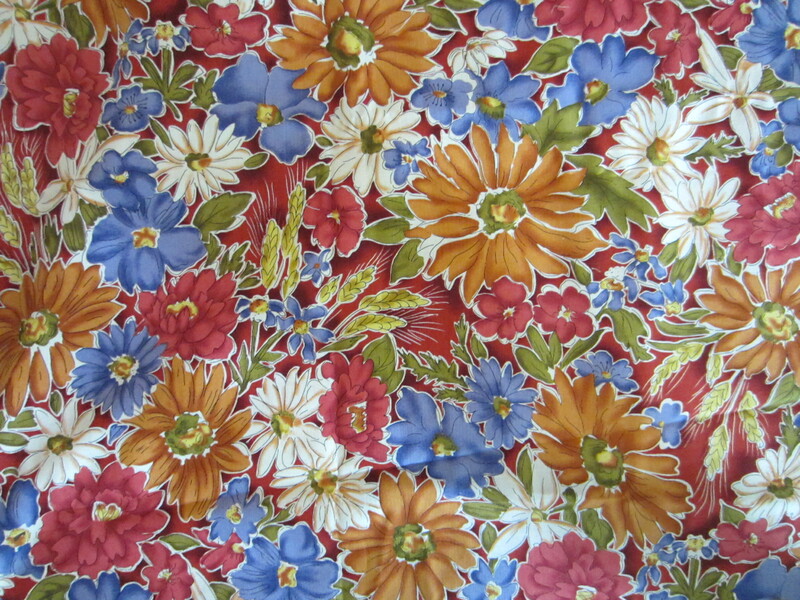 I liked this floral fabric a lot when I bought it years ago and found some coordinating prints. 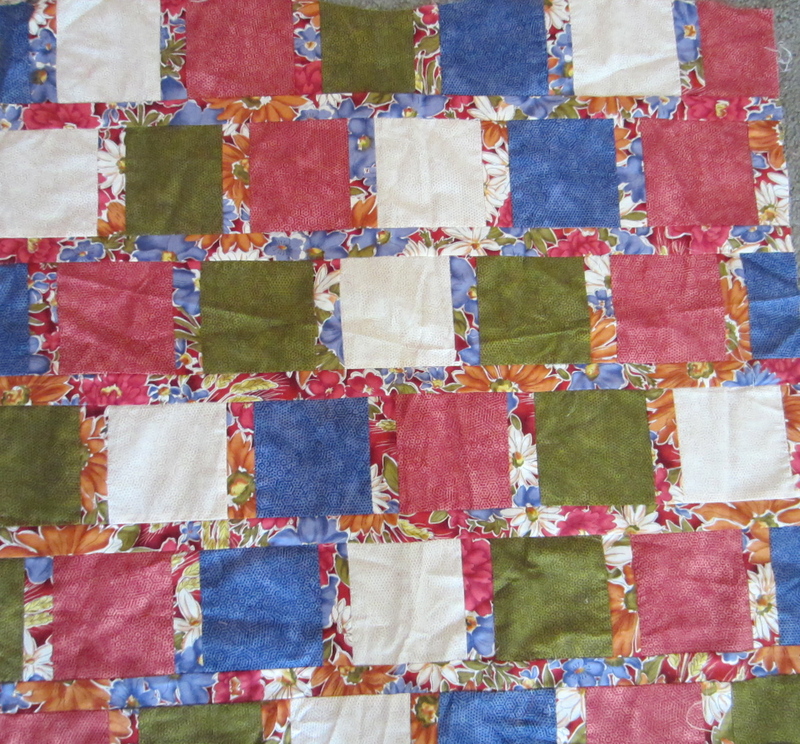 I started some piecing, thinking to make it into a quilted jacket. That’s not going to happen. 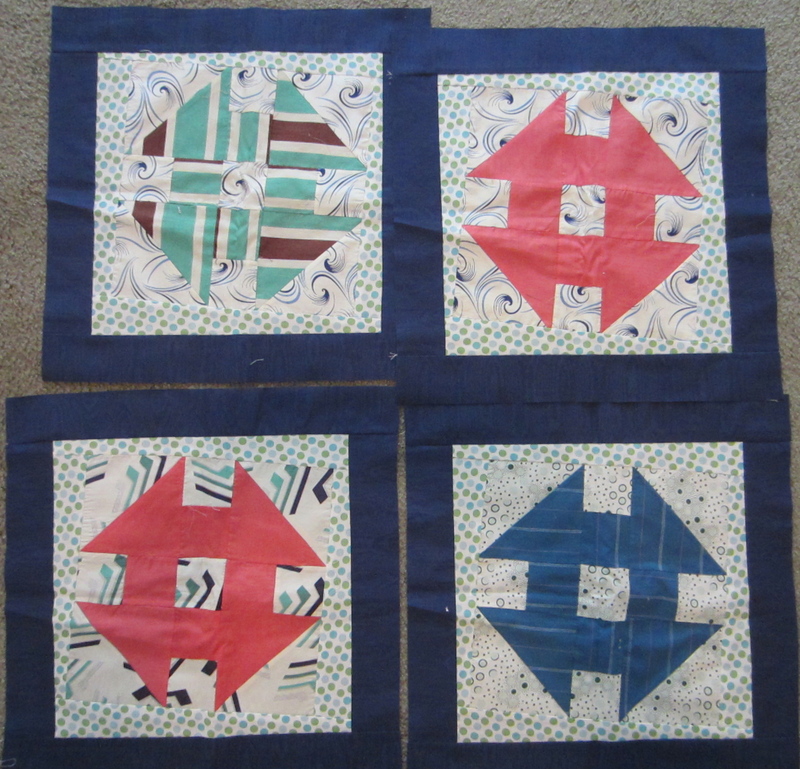 But it would make a nice charity quilt. Here are a couple small holiday items. It wouldn’t take much to finish them. I just have to have a reason. 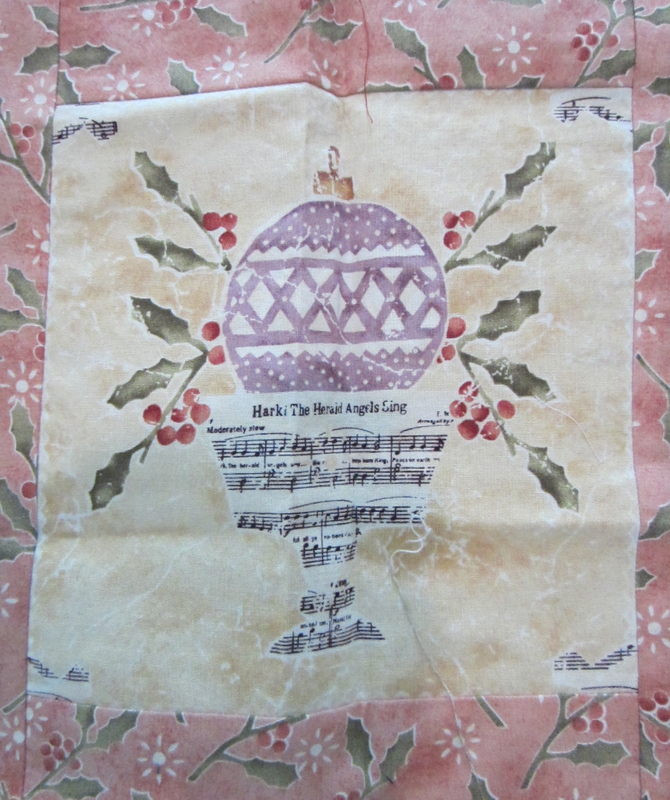 Loved the unusual color scheme in these holiday prints. These “orphan” blocks I picked up at a guild meeting. 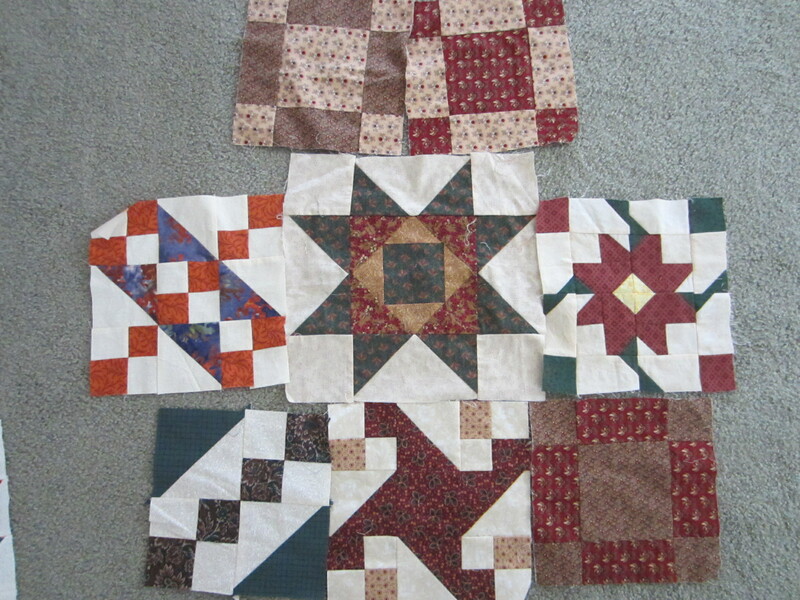 I’m sure I could combine them into nice charity quilt. 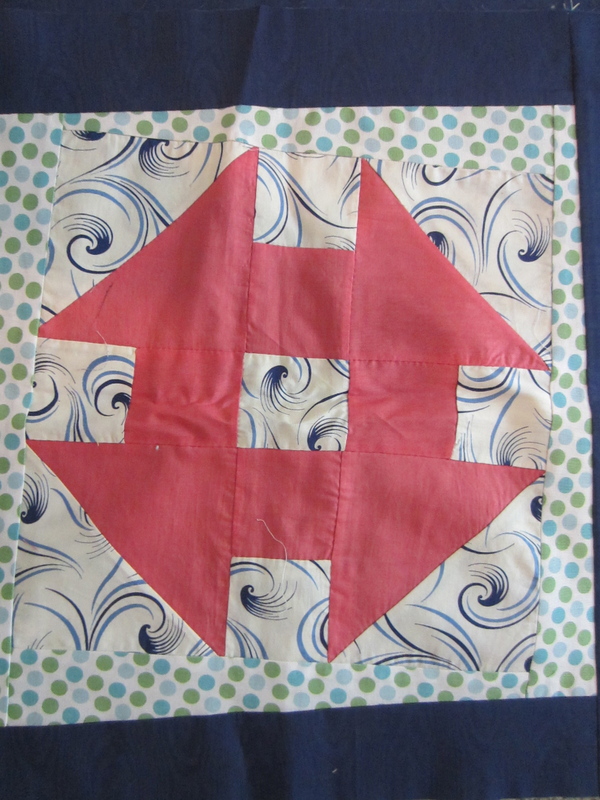 Our guild makes quilts for a local shelter for women and children. Well, I could go on and on, but I will stop for now. Time to get sewing!